(a) Inspect the tires (See page ). Before inspecting the wheel alignment, adjust the vehicle height to the specified value. Be sure to perform measurement on a level surface. If it is necessary to go under the vehicle for measurement, confirm that the parking brake is applied and the vehicle is secured with chocks. (a) Bounce the vehicle up and down at the corners to stabilize the suspension. (b) Measure the vehicle height. (a) Install a camber-caster-kingpin gauge and place the front wheels on the center of a wheel alignment tester. 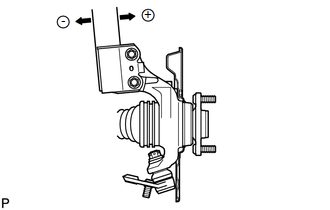 (b) Inspect the camber, caster and steering axis inclination. Inspect toe-in after the camber has been adjusted. (a) Remove the front wheel. 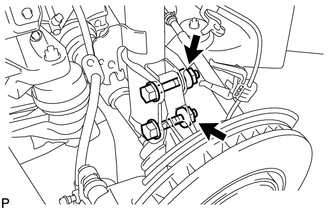 (b) Remove the 2 nuts on the lower side of the front shock absorber. 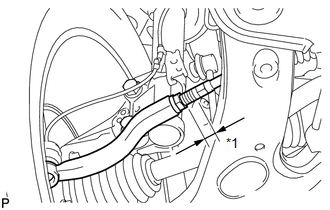 (c) Clean the installation surfaces of the front shock absorber and the steering knuckle. Keep the bolts from rotating when tightening the nuts. (g) Install the front wheel. If the measured value is not within the specification, calculate the required adjustment amount using the formula below. Check the combination of installed bolts. 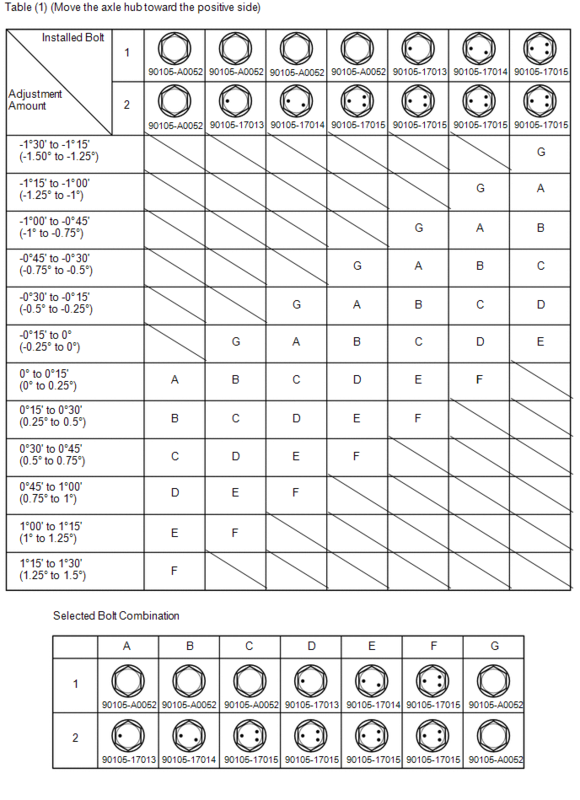 Select appropriate bolts from the table below to adjust the camber to the specified values. Try to adjust the camber to the center of the specified values. 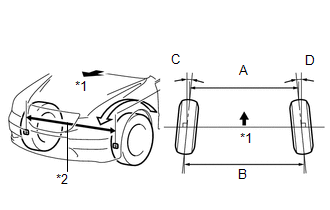 The body and suspension may be damaged if the camber is not correctly adjusted according to the above table. Replace the nut with a new one when replacing the bolt. (i) Repeat the steps mentioned above. 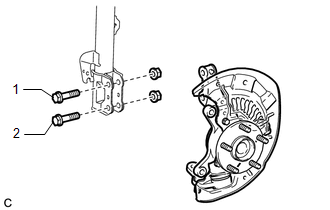 In step (A), replace 1 or 2 selected bolts. Replace one bolt at a time when replacing 2 bolts. (b) Release the parking brake and move the shift lever to N.
(c) Push the vehicle straight ahead approximately 5 m (16.4 ft.)*1. 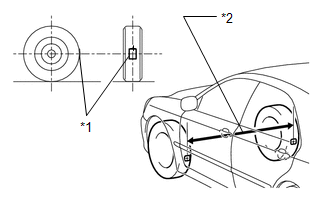 (d) Put tread center marks on the rearmost points of the front wheels and measure the distance between the marks (dimension B). 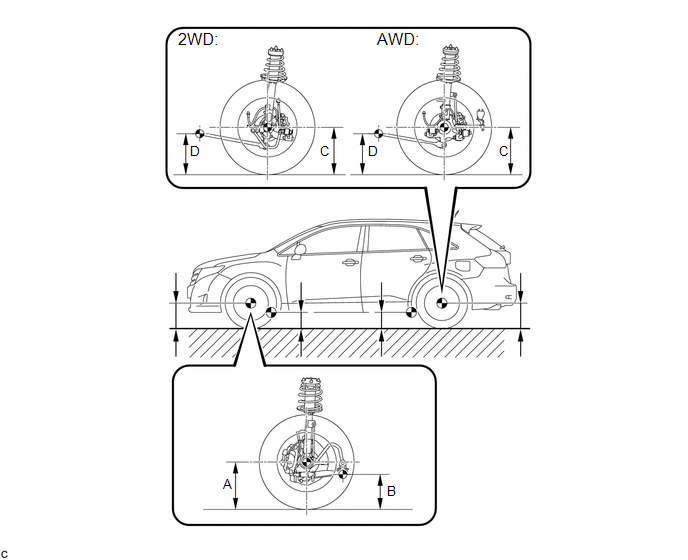 (e) Slowly push the vehicle straight ahead to cause the front wheels to rotate 180° using the front tire valve as a reference point. Do not allow the wheels to rotate more than 180°. 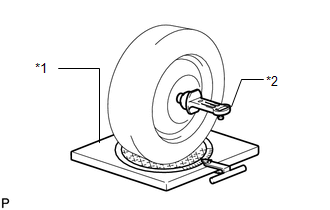 If the wheels rotate more than 180°, perform the procedure from *1 again. (f) Measure the distance between the tread center marks on the front side of the wheels (dimension A). If the toe-in is not within the specified range, adjust it at the rack ends. 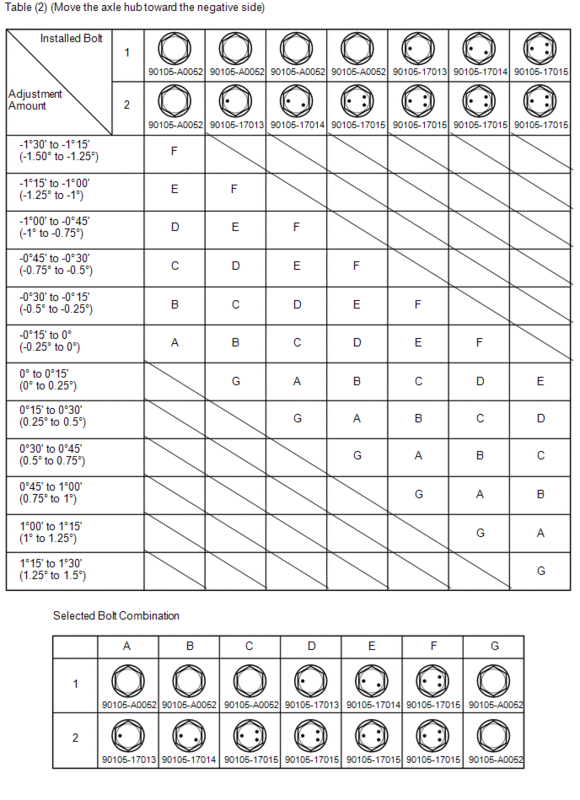 Measure "B - A" only when "C + D" cannot be measured. (a) Make sure that the lengths of the right and left rack ends are almost the same. (b) Remove the rack boot set clips. (d) Adjust the rack ends if the difference in thread length between the right and left rack ends is not within the specified range. (1) Extend the shorter rack end if the measured toe-in deviates toward the outside. (2) Shorten the longer rack end if the measured toe-in deviates toward the inside. (e) Turn the right and left rack ends by an equal amount to adjust the toe-in to the center value. (f) Make sure that the lengths of the right and left rack ends are the same. (g) Tighten the tie rod end lock nuts. 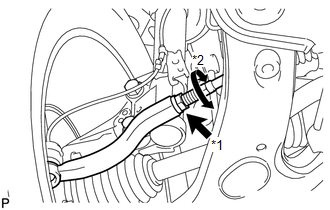 Temporarily tighten the lock nut while holding the hexagonal part of the steering rack end so that the lock nut and the steering rack end do not turn together. Hold the width across flat of the tie rod end and tighten the lock nut. (h) Place the boots on the seats and install the clips. (a) Put tread center marks on the rearmost points of the turning radius gauge. 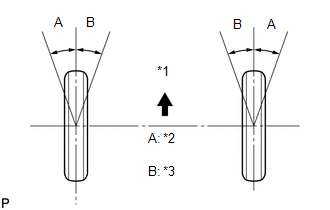 (b) Turn the steering wheel to the left and right full lock positions, and measure the turning angle.